GET READY TO BECOME A GUITAR IMPROVISATION EXPERT! with Blues and Rock music around the entire fretboard! the play along tracks to practice with. Connect licks together to create endless combinations. play from one end of the neck to the other. offs, slides, vibrato, bending, etc. and create licks on the spot! Videos can be watched in wmv (windows) or mp4 (mac) format. The tablature Ebook comes in a PDF file. The Ebook contains tablature and no standard notation. playing everything in every key. Learn to practice like a pro. tricks, effective exercises and a good constructive solo improvisation using all 5 scale shapes one at a time. Everything fully transcribed in the Ebook! Get out of your rut and advance your guitar playing today! 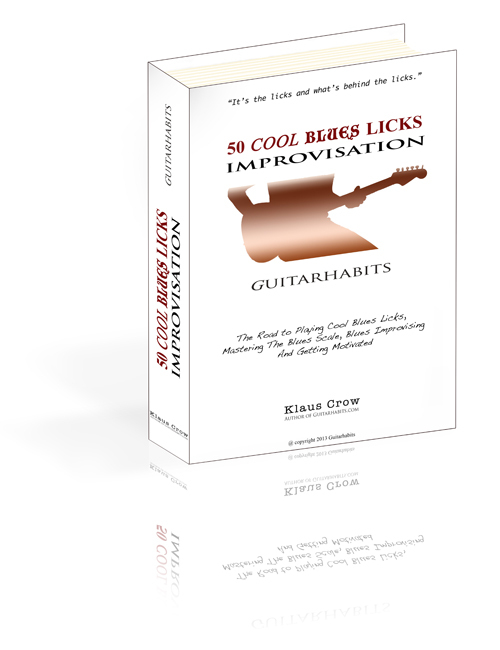 Read what other guitar players have to say about "50 COOL BLUES LICKS IMPROVISATION"
Hey Klaus, I have just bought the "50 cool blues licks Improvisation" because I like your way of explaining things. I just downloaded your course tonight. Great stuff! Your teaching style is simple, practical and straight forward. Keep up the good work! Respectfully, Larry Williamson, Philadelphia, PA.
Hi just want to say your course is the best on the internet. Klaus, I got so much value from this course, it changed my whole playing. your Improvisation Skills to the Next Step!